T.G. 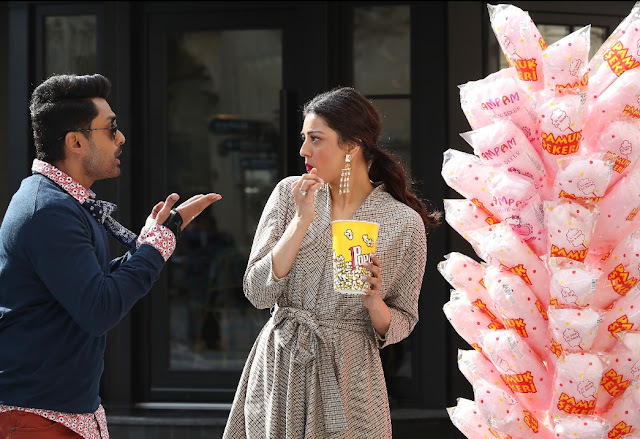 Viswa Prasad is presenting the film, Manchi Lakshnalunna Abbayi, MLA, starring Nandamuri Kalyanram and Kajal Aggarwal in major roles. The movie is produced by Blue Planet Entertainments, in association with People's Media Factory, by Kiran Reddy and Bharat Chowdary. Upendra Madhav is being introduced as the director with this movie. The movie is releasing on 23rd of March and the team interacted with press to talk about the film. T.G. Vishwa Prasad, the presenter of the film said, " We made two independent films in US under our banner and this is our first feature film. We hope this will be a success." Kiran Reddy from Blue Planet Entertainments said, "We produced Nene Raju Nene Mantri, last year in association with Suresh Productions. We learnt a lot from that experience and we are thankful to Suresh Babu for that. Now, we are producing MLA, with People's Media Factory. We have completed the post production works and all other works too. The movie is going for censor on 15th March. We are confident in the abilities of Upendra Madhav and hope to repeat the success of Nene Raju Nene Mantri, if not, even bigger." Vivek Kuchibotla said, "We have already released 2 songs from the album and they have been successful. In the coming days,we will release other songs too. The film will release on 23rd of March." Bharat Chowdary said, "We are thrilled to be producing our second feature film and Nandamuri Kalyanram has been helpful throughout the production. We are ecstatic with the response for our teaser and two songs released till now." Director Upendra Madhav said, "I am thankful to my producers and Kalyanram sir, for trusting me and giving me this opportunity. MLA is not a political film, it is a complete family entertainer. You will enjoy the movie as it was complete fun for us to shoot it. The first half of the film is set in Corporate backdrop and second half in rural backdrop. On 23rd March, we will meet and hopefully entertain you to the core." Ravi Kishan, Jayaprakash Reddy, Posani Krishna Murali, Ajay, Vennela Kishore, Pridhvi, Sivaji Raja, Prabhas Seenu, Laasya, Manali Rathod are playing other key roles.